Памер гэтага PNG-прагляду для SVG-файла: 300 × 200 пікселяў. Іншыя разрозненні: 320 × 213 пікселяў | 640 × 427 пікселяў | 800 × 533 пікселяў | 1 024 × 683 пікселяў | 1 280 × 853 пікселяў. Attributed flag of the Timurid Empire (the reference dates to 1375, but it it not necessarily the design of any flag in actual use). (Quote from original by en:User:Ingoman) Flag of the Timurid Empire according to the Catalan Atlas c.1375 created by James Dahl The three bezants arranged in a triangle is the "Symbol of Peace". 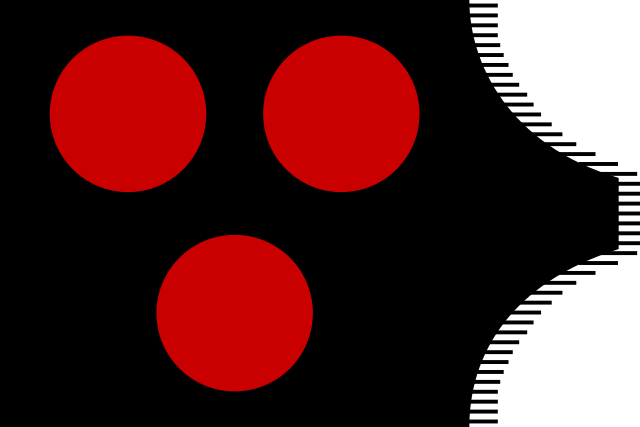 I have seen a variant shown of this flag which has the bezants pointing upwards, and they are white on a light blue background, but I have found no evidence to support this, and it is doubtless a reconstruction based on coinage (which also features the Symbol of Peace) with the colours a matter of congecture. However, in historical accounts of the flag of Tamerlane, he is always described as bearing a flag of black, red and white, which Europeans incorrectly interpret as a tricolour for lack of a description of the flag's devices. (the white is probably a fringe). Since I have never found reason to doubt the accuracy of the Catalan Atlas in terms of flags (it has proven in fact to be the most trustworthy document of the time period) I have concluded that this in fact was Timur's flag. 18:16, 11 лістапада 2013 300 × 200 (2 KB) TRAJAN 117 Fixed nodes, flipped. 18:15, 11 лістапада 2013 300 × 200 (2 KB) TRAJAN 117 Fixed nodes, flipped.